Shortly after the Dagoola IV escape detailed in the novella "Borders of Infinity", Miles and some of his Dendarii mercenaries arrive on Earth, fleeing Cetagandan retribution and desperate to repair the damage suffered by their ships. Miles visits the Barrayaran Embassy so the Dendarii can be paid for their last mission. There he finds his cousin Ivan Vorpatril working for the distinctly hostile Captain Duv Galeni, who turns out to be a Komarran related to one of the alleged victims of Miles' father. Miles is reassigned to the Embassy as Third Military Attaché, under Galeni's command. Further complicating matters, Miles discovers he has a clone, created and trained as an assassin by Komarran diehards determined to free their planet. The assassination plot is foiled. Miles allows his clone to escape; by Betan law, the clone is his brother, and Miles is well aware his formidable mother would be greatly displeased if he got rid of his troublesome new sibling. According to Barrayaran tradition, his brother would be named Mark Pierre Vorkosigan. In exchange for "Mark" helping Miles fool the Cetagandans, who are beginning to suspect that Naismith and Vorkosigan are the same person, the psychologically scarred Mark is let go with a considerable sum of money and the invitation to claim his Barrayaran heritage, if he wants to—or dares. So it’s weird really that it’s only the second book about Miles, in publication order. Fand ich schon witzig, daß "Brothers in Arms" das zweite publizierte Miles-Buch ist. Man merkt es auch, der Geschichte fehlt noch so ein bißchen der geschliffene Stil und das ausgefeilte Story-Telling, das später geschriebene Miles-Geschichten ausmacht. 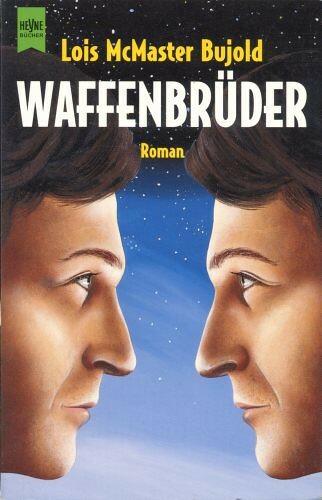 Aber ich glaube, das war Lois McMaster Bujold gar nicht so wichtig, denn auch hier ist die Emanzipations-Botschaft das eigentlich Wesentliche. Bujold sagt hier, daß es nicht nur vollkommen egal ist, welches Geschlecht Du hast, sondern auch, wie Du entstanden bist. Nicht umsonst umarmt Miles seinen Klon als Bruder, Mark Vorkosigan, Mensch (und Barrayaner) aus eigenem Recht. Diese unaufdringliche, aber deutlich zwischen den Zeilen schwebende Botschaft macht den Reiz des Romans aus, der ansonsten zusammen mit dem nächsten Roman nur dazu dient, die Bühne für den zweiten Akt der Miles Naismith-Romane vorzubereiten.